Europe’s fifth and final Automated Transfer Vehicle departed the International Space Station for the last time Saturday, closing out one of the European Space Agency’s flagship programs as the bus-sized spaceship heads for a destructive re-entry Sunday. 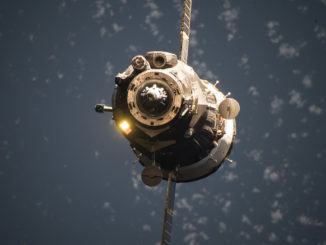 Hooks linking the ATV supply ship to the space station’s Russian-built Zvezda service module opened and the cargo carrier backed away from the complex at 1342 GMT (8:42 a.m. EST), receding into darkness as the vehicles flew in a night pass 257 miles over Mongolia. Distinguished by X-wing shaped solar panels, the 32-foot-long, 14-foot-wide spaceship — about the size of a London double-decker bus — is named for Georges Lemaitre, the Belgian priest who first proposed the Big Bang theory for the formation of the universe. “The era of European space freighters supplying the International Space Station comes to an end with the undocking of the Georges Lemaitre,” said Rob Navias, NASA TV’s commentator for the undocking. The fifth Automated Transfer Vehicle arrived at the space station Aug. 12, delivering about 14,500 pounds of cargo, air, water and fuel after a two-week rendezvous in which the spacecraft tested next-generation laser navigation sensors that could be used by future missions to clean up space junk or dock with an asteroid. The lab’s crew finished loading trash into the spacecraft before closing hatches Friday, installing nearly 2.4 tons of rubbish for disposal. The 450 million euro ($512 million) mission will end Sunday when the ATV is driven back into Earth’s atmosphere for a fiery plunge over the South Pacific Ocean. A pair of de-orbit burns are planned for 1429 GMT (9:29 a.m. EST) and 1726 GMT (12:26 p.m. EST) Sunday, with re-entry expected at 1812 GMT (1:12 p.m. EST). The supply ship will succumb to heat and intense pressure when it hits the atmosphere, breaking up and spreading a debris field over a stretch of the remote South Pacific between New Zealand and Chile. NASA and European Space Agency scientists hoped to observe the dynamics of the ATV’s re-entry in an experiment later this month. Ground controllers planned to guide the ATV on a trajectory into Earth’s atmosphere shallower than usual at night, and airborne observers aboard a NASA DC-8 aircraft, two data recorders aboard the ATV and cameras on the space station would have monitored the re-entry and captured data on the spaceship’s break-up. But a battery in one of the ATV’s four power chains failed Feb. 3, and while the spacecraft can still perform its mission normally, ESA officials concerned over the loss of redundancy in the electrical system decided to abort the shallow re-entry experiment. The ATV will now execute a normal steep re-entry profile in daylight Sunday, similar to the trajectories used on the craft’s previous missions. 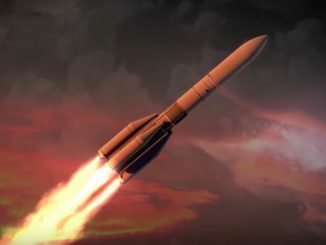 “The increased risk of a second failure in the 13 days of free flight before the (Feb. 27) re-entry, and the impossibility of shortening this phase because of heavy station traffic and other ATV operational constraints, has led ESA to cancel the shallow re-entry,” ESA said in a statement. 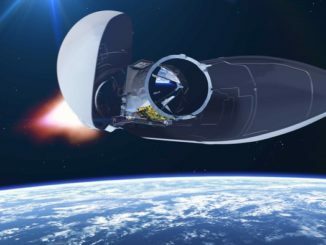 A European-built infrared camera and communications package will still record imagery and transmit data to scientists via Iridium satellites during re-entry. The camera will burn up, but the communications transmitter is encased in a ceramic heat shield to send the data back to scientists before impacting the ocean. Scientists and NASA mission planners were interested in the re-entry to collect data on how a large spacecraft like the ATV responds to the intense heat and pressures of re-entry, eventually leading to the vehicle’s break-up. The data would have helped officials plan for the eventual destruction of the space station itself, which will be driven into Earth’s atmosphere when its useful life is over — an event currently expected in the 2020s. The space station’s re-entry will require careful planning, and maneuvers by several Russian Progress supply ships to lower its orbit and guide the 450-ton complex safely toward the uninhabited South Pacific. 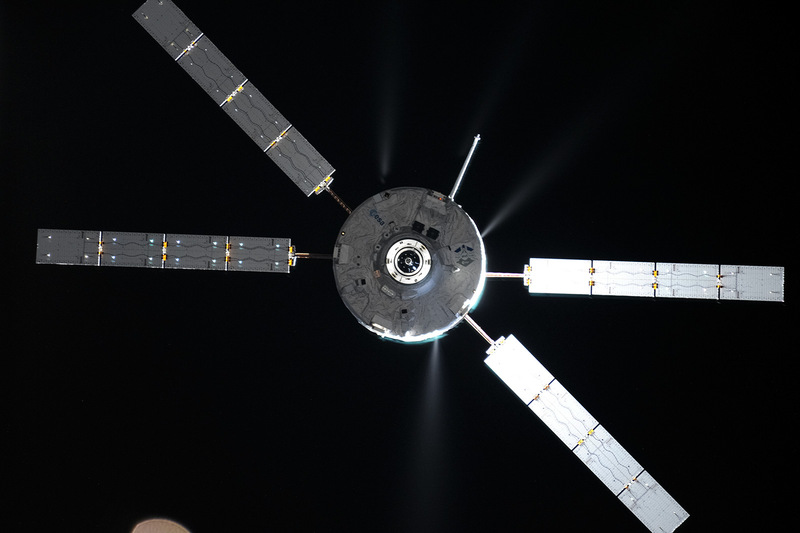 Europe’s ATV was originally tapped for the task — it could accomplish the re-entry in a single mission — but the ESA cargo craft is being retired with the conclusion of its current flight. NASA may attempt a destructive shallow re-entry with one of the space station’s other logistics vehicles, which are smaller than the ATV but could still provide useful insights into re-entry conditions. NASA decided remove its own re-entry data recorder from the ATV for possible use on a future mission. The ATV is the largest spaceship servicing the station since the retirement of the space shuttle, but its capabilities are no longer needed as a mix of U.S., Russian and Japanese cargo carriers deliver supplies, experiments and fuel to the complex. Billing itself as a research and development agency chartered to work on new technical capabilities — rather than manufacture and fly “copies” of an operational spacecraft — ESA opted to end construction of the Automated Transfer Vehicle to put engineering teams to work on development of a new project building on the cargo ship’s success. ESA developed the ATV and flew the five missions as part of a barter agreement with NASA to pay for Europe’s share of the space station’s operating costs through 2017. With the five ATVs, Europe sent up 31,446 kilograms, or 69,327 pounds, of cargo, fuel, water and air to the space station, according to Thomas Reiter, head of ESA’s human exploration and operations directorate. The missions spent a cumulative 776 days docked to the space station on missions launched in 2008, 2011, 2012, 2013 and 2014. NASA and ESA agreed for Europe to design and build a service module for the first unpiloted test flight of the Orion deep space exploration vehicle beyond Earth orbit in 2018. The European contribution to the Orion program will cover ESA’s share of the space station’s costs through 2020, a figure estimated around 450 million euros ($512 million).